Our famous breakfasts are served in the heavily beamed dining room. We always provide a bowl of freshly prepared fruit for starters and then you may select from a full breakfast menu to follow. Of course, a full English is the favourite, but we cater for all requirements, including vegetarian. All ingredients are locally sourced, with eggs from a nearby farm and bacon and sausages from the local prize-winning butcher. Please advise well in advance if you have any special dietary needs or allergies. 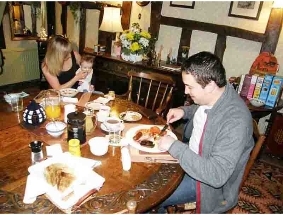 Guests enjoying a ‘Full English’. We also cater for young children. Sadly our two village pubs have closed, but do not despair. 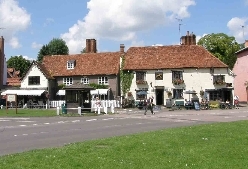 There are many good hostelries serving excellent food and drink within a couple of miles. Details of recommended places to eat are included in an information folder to be found in your room.